The musical intruments being sold at auction can usually be neatly divided between wind and string instruments. The wind instruments include clarinets, flutes and picolo with Boosey & Hawkes being prominent makers of wind instruments seen at auction. 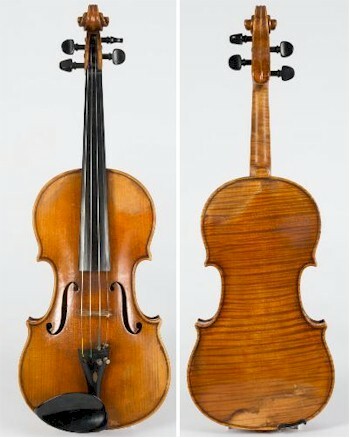 A Violin by Fritz Arnold Bruckner (FS25/611). String intrucments include violins, viola and cellos. Violins and viola are often copies of those produced by the famed Stradivarius family, especially those by Antonio Stradivari who flourished during the 17th and 18th centuries. 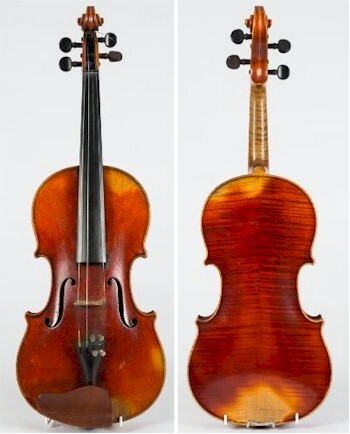 Other famous stringed intrument makers include the Italian Amati family who flourished between 1538 and 1740 as well as the well-known London violin maker Joseph Hill (1715–1784) and the famous Italian luthier Giuseppe Fiorini (1861–1934). 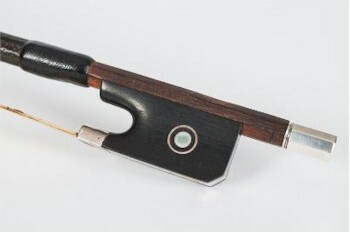 A Silver Mounted Violin Bow by PW Bryant (FS25/614). The price of string instruments is usually determined by whether the sound box consists of one or two pieces, the colour of the instrument's varnish and the nature of its flaming (the tiger-like pattern of the wood). It is worth noting that musical intruments sold at auction can represent a good source for music students searching for either wind or stringed instruments.